We can't say enough about our place . It is our home for one half of the year. But if you really want to get an objective view , please look at the many raving reviews. We have just added WiFi, high speed internet and 2 new big flat screen TV's with blue ray DVD players. Most importantly, we have also added a 4000 sq. ft. play area for kids and pets that is over looked by the back balcony and completely enclosed with a 4 ' high wood beam and wire mesh fence. Before, purchasing this property, we spent 6 months looking at in person or on line close to 100 cabins in Pinetop. This was the best by far and is why we call it the 'Perfect Cabin'. The property is beautifully decorated and located in an upscale portion of the Pinetop Country Club. It is on a cul-de sac with just a few other high end cabins that are within sight, but just far enough away to preserve the privacy and solitude of the forest and features two large balconys so you can enjoy the outdoors. 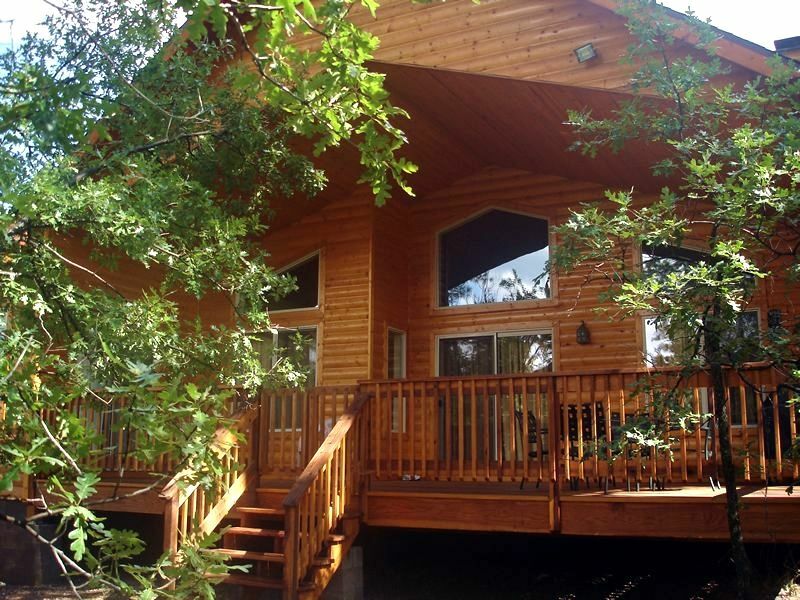 This cabin has a three bedroom split floor plan, with a large master suite and bathroom. Summer: Beautiful days and cool nights are a perfect escape from the desert heat. Close to many great trails, fishing lakes and streams. Winter: Cozy up to a warm fire after spending the day at Sun Rise Ski resort just 23 miles from Pinetop Country Club! This property is close to all the restaurants and services in Pinetop. Three miles from Honda Casino, area golf courses and activities nearby. You will love it! If you have questions please call me and I will try to accommodate your special requests. Cabin sleeps 8 comfortably, One king bed, one queen and two sets of bunk beds. Located in Pinetop Country Club, close to restaurants and services. Everething ok. Great location. Needs new kitchenware. What a wonderful cabin in a great location. The cabin is beautiful and we really enjoyed a relaxing vacation with our family. Definitely would like to stay there again. We really enjoyed our stay in this beautiful and comfortable home. This cabin was perfect! Nice large patio, kitchen completely stocked with all the dishes we needed. We thoroughly enjoyed our stay. This house was just the right house for my sister and I. Decorations suited our taste. The house was clean and had everything we needed. Very friendly to our little dogs who had a great time and enjoyed the fenced in yard immensely. I had to remote in to work some days and took my laptop on the deck and enjoyed the company of a couple acorn woodpeckers working on there home. Unfortunately for us, we picked the hottest week of August to be there, but we bought an extra fan to keep the temp comfortable during the day and were thankful we weren't in the Phoenix metro area! From the moment we entered Wanda's cabin, we felt completely at home. The cabin is tastefully decorated and the kitchen is fully equipped. My husband, fur baby Belle and I cooked all of our meals in the cabin except one. The fenced backyard was perfect for Belle. We loved sitting on the back patio watching all of the beautiful birds and sunsets. Wanda is great to work with. I highly recommend Wanda's cabin for a chillaxin time. We look forward to spending more time at our new home away from home.